The Aegean Islands are a group of islands in the Aegean Sea, with mainland Greece to the west and north and Turkey to the east; the island of Crete delimits the sea to the south. The ancient name of the Aegean Sea, Archipelago, was later applied to the islands it contains and is now used more generally, to refer to any island group. Almost all of the Aegean Islands belong to Greece, being split among nine administrative peripheries. 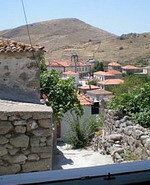 Amethyst is a village house, in the heart of the village of Thanos, on the island of Limnos. The metre thick walls, the pine floors, the exposed roof timbers, the stone fireplace, the white washed stone walls, are all typical of the local architecture. From the windows, and from the terrace the views sweep across the fields down to the beach and the sea. Inside you will find every home comfort. A small but fully equipped kitchen. A dining/living room with a large convivial table surrounded by ancient taverna chairs and a large sofa covered with soft multicoloured cushions facing the fireplace and shelves of books to browse through. Upstairs a large bedroom with a lounge area with flat screen TV, and a soft king-sized double bed, just like in a five star hotel. The bathroom is small but well equipped with a large tiled shower, and a washing machine. In short all the advantages of a cosy hotel hidden in the middle of a quiet Greek island village. Sleeps 2-4. 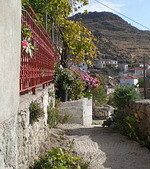 Isatis is a two bedroom village house, in the heart of the village of Thanos, on the island of Limnos. It is the sister property of the one bedroom "Amethyst". We have renovated and decorated it in a style combining the simplicity of a village house with the comforts of a fine hotel. The metre thick walls, the exposed roof timbers, the white washed stone walls, are all typical of the local architecture. From the windows, and from the terrace the views sweep across the fields down to the beach and the sea. Inside you will find every home comfort. A large fully equipped kitchen, with a washing machine. A dining/living room with a large convivial table surrounded by ancient taverna chairs and a large sofa covered with soft multicoloured cushions facing the flatsceen TV with DVD and Satellite. There are also shelves of books to browse through. Upstairs two bedrooms, one with a soft king-sized double bed, the other with twin beds. Sleeps 6. 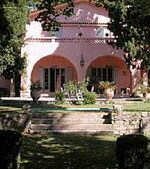 The Red House is a two level traditional house that accommodates 8 people. Two of the rooms open onto the terrace overlooking the beautiful gardens and the plunge pool. The house has its own character and charm and features modern amenities including a fully equipped kitchen, stylish décor and large bedrooms. The Red House large, airy and high-ceilinged sitting room with a huge fireplace opens out on a tiled terrace overlooking the romantic garden and is furnished with a selection of antiques and artworks that are appropriate to its style. The kitchen, the larder, a small guest room and a large bathroom are also on the ground floor next to the living room. A grand wooden stairway leads up to the landing and the three double bedrooms which are on the first floor. There is also a studio or little house that you can rent with The Red House. It sleeps 4 people and has its own kitchenette and bathroom. Sleeps 8.